I got up about 6:30am and feeling absolutely knakered after the day before. I sorted all my stuff, got my VISA application documents together and headed off. I got to the immigration office at 8am as planned and signed in. It turns out I didn't have a photo copy of the page in my passport with my entry into Bali stamp which I needed, and was given directions to a small place near by to get it done. Why they don't have a photo copyier in a govenment office which you could pay them to copy a piece of paper is way beyond me! As expected it took a while to find this tiny little place with a few huge old style photocopy/printers. It cost less than 20p to get the copies, and then I was back to the Immigration place at 9am (which funnily enough was the time they decide to start processing foreign VISA's, despite opening an hour earlier). I filled out all the documents and put them with my passport and photo copies in a paper wallet. Luckily I was one of the first called, gave them my wallet of stuff, which she flicked through and told me to wait till my name was shouted. Nearly an hour later I was fed up of waiting for what appeared to be sod all, and hasstled them. They used the opportunity hand me an invoice telling me to come back at 9am on the 9th (2 days time) and 'just pay'. I was then free to go, and blitzed it back to Bingin (fortunately the weather was overcast but not raining) on the scooter. When I got back Wesley and I went round to Maurice and Bo'a again for 'breakfast' (despite being mid day), as the 3 of them had just woken up. 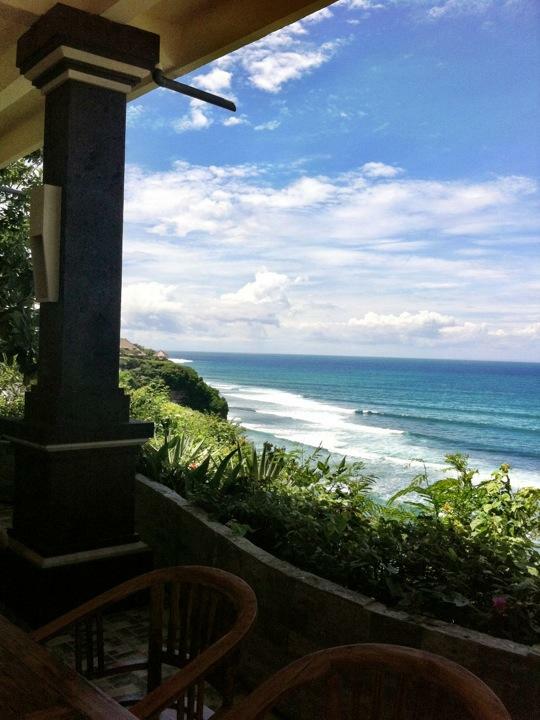 We ate and watched the surf from the uminfinity pool, by which time it was beautiful day and bright sunshine. They had some friends in Bali who were at the beach in Nusa Dua, so we went to join them for the arvo as the weather was so nice. Plus I was keen to check out the area I'd be staying with Mum and Dad. Before we left I made the most fatal mistake of the day - choosing to take my Poncho out of my scooter. The drive there took about 45 minutes ish, and was pretty good fun with our little 3 bike convoy in dry sunny weather. I was shocked at what the Nusa Dua area is like! It's ovbiously been created into one large tourist area/resort. There is a big entereance with barriers and a security man man, then the most pristine roads/flowerbeds/roundabouts etc I have seen in Bali. A map showed that the whole area had been sold off to various companies to make luxury self contained resorts. I obviously made a point of find where the 'Marriot' is that I'll be in with the parents. It appears to be a bit further north, so out the way of the main entereance area, and hopefully a bit quieter. We parked up at a certain beach i cabt remember the name of and met their friends, who had camped up on a few of the sea of sun beds. The beach is much nicer there than in the Canggu area - its golden sand/coral and the sea is relatively blue and there is no rubbish littered everywhere. We also camped up on the sun beds, and swam in the sea to cool off. To my surprise there was a huge amount of surf on the that side of the island. Beyond the 200m lagoon area off the beach, was a barrier reef with 8ft+ surf thundering across. The waves looked incredible and I couldn't understand why there were no surfers, until I went for a swim - the cross shore current was running really quickly even at the beach, so god knows what it was like out back. We got a couple of hours of lovely sunshine, then in 10 minutes it went from that, to completely clouded over, to POURING rain. As I say I had made the extremely foolish decision of leaving my Poncho and only had a wife beater to wear. We ate some early tea, hoping it would pass, but was clearly there for the night. In the end we decided to just rough it out in the rain. It was so bad that we called a Taxi for Bo, and just us 3 guys would scooter back. That turned out to be a life saver. The weather only got worse, and by the time we were leaving it was dusk. As we left it was if we drove into a full on hurricane - the rain was so hard it was like a continuous bucket being poured on your head and the wind made each drop sting and it hit your face, not to mention nearly blowing us off the road. I had to wear sunglasses as the rain to the face was almost too much to bear but that caused more problems - A) Sunnies in the dark don't work well B) the rain hitting them gave you almost no visibility what so ever. In the end we just tail gated the taxi for 45 minutes as the red lights were all I could make out and the road was virtually invisible. It was also fun and games when you reached a flood, as the first you knew about it was a thud and the front wheel hit it, and the water washing up over your feet. By some miracle we all made it back in one piece, without hypothermia or falling of the bikes due to potholes/floods/gusts of wind/fallen trees. We all went back to Maurice and Bo'a for hot soup and tea, before Welsley and I fell asleep straight away exhausted. Before I fell asleep I remember thinking how much you'd have to pay me to suffer that again, and coming to a conclusion that £1Million may only marginally make it worth it haha. An eventful end to a beautiful-turned-hellish day!